During the period I worked as consultant physician and paediatrician at the Polonnaruwa Base Hospital (from 1986 to 1988), I saw the aftermath of the brutality of the LTTE in butchering innocent civilians in Trincomalee (the new year massacre of 225 civilians between Aluth Oya and Kithulotuwa in April 1987, Medirigiriya district massacres in Ambagaswewa and Meegaswewa and massacres at Kadawathamaduwa). Having witnessed the results of these massacres, I was deeply moved and determined to help these innocent victims living in these threatened areas, risking their lives and facing tremendous economic hardships. However, the presence of the Sinhalese in the threatened villages was essential to preserve the sovereignty, territorial integrity and unitary State of our nation. Success Colombo (Society for the Uplift and Conservation of the Cultural Economic and Social Standards), which I founded in Colombo along with patriotic friends in the lines of Success Sri Lanka Kandy has been at the forefront helping the people living in the formally threatened areas of Weli Oya, Trincomalee, Ampara and Vavuniya. We have worked continuously and visited these areas every month on a rotational basis from 1995 to date. These people whom we consider as real Bhumiputra have continuously lived in the areas during the 30-year war which ravaged our nation. During this period, they have faced tremendous hardships facing security risks and difficulties in health, transport, education and the economic fronts. Our work has comprised of conducting free medical clinics, provision of medicines, motivating them, providing them with agricultural equipment, constructing agricultural wells and providing assistance to build their homes. We have also provided finances to renovate dilapidated school buildings and provided the infrastructure for pre-school education. We have also provided sewing machines to women to encourage self-employment projects. Above all, our frequent visits have improved their morale and provided a lifeline to them in times of need. We have held over 500 medical clinics in the Weli-Oya area (Sampath Nuwara, Athawetunuweva, Nikaweva, Kiriibbanweva, Ahatugasweva) and in Ampara (Mangalagama, Aranthalawa, Gonagala, Pollebedde, Tenpitiya, Bakmitiyawatha, Bogamuyaya) and in Trincomalee (Gomarankadawala, Kalyanapura, Dehiwatta, Mihindupura, Sirimangalapura, Velgamwehera) and in Vavuniya (Atambagaskada, Track 7, Avaranthulawa, Thanthirimale, Mamaduwa, Alagalla, Mahakachchikodiya) etc. We have visited these areas every month for the past 15 years on a rotational basis. The Buddhist priests in these areas have been a tremendous source of strength to people living in these formally threatened villages. The priests too have faced tremendous hardships regarding Dhana, transport and their security. Success Colombo has often provided financial assistance to renovate dilapidated Sangawasa, construction of Chaithyas and provided 15 motor bicycles, one truck and a three-wheeler to temples in these threatened villages. Success Colombo has befriended the Sri Lanka Army in numerous ways. We have provided an ambulance, a tractor and a trailor, millions worth surgical equipment including pulse oxymeters, power driven orthopaedic equipment, state-of-the-art equipment for skin grafting, dopler scanners and urgently required surgical suture material, trolleys, medicines etc to provide maximum assistance to our Ranaviru injured in action in defence of our Motherland. Ranaviru recuperating at Ranaviru Sevana in Ragama have been provided with special commodes, wash basins, with all attachments, crutches and most up-to-date physio equipment costing over a million rupees to help our Ranaviru to recuperate and return to normalcy. We have helped the military camps in Weli Oya, Galkulama, Thavulweva by providing cement to build quarters for new recruits, auditoriums, bunkers, bathing tanks, medical examining rooms etc. During the liberation of the Vanni, we provided much needed thick polythene, folding mattresses, thick Rexene sheeting, anti fungal powder and massive stock of water bottles, mosquito coils, sweets, biscuits, tea, soap, toothpaste etc to improve the morale of our brave Ranaviru engaged in the supreme task of saving our Motherland. During the liberation of the Vanni when the Sri Lankan Armed Forces led the world’s greatest humanitarian operation in liberating over 300,000 people from the clutches of the LTTE. Success Colombo was one of the first civilian groups to reach a helping hand to the Tamil civilian human avalanche. We conducted medical camps at Menik Farm Zone One to Four and in other towns viz Pompemadu, Neriyakulam and Chettikulam fortnightly from March to June 2009. We treated thousands and thousands of patients suffering from exhaustion, dehydration, skin infections, chest infections, bowel infections, chicken pox, cuts, wounds and ulcers and provided free medicines and dressings. We also provided milk powder of infants, kitchen utensils such as saucepans, kettles, pails, jugs, plates, cups etc for the IDPs. After the resettlement of IDPs in their former homes, we have conducted free medical clinics and provided free medicine for IDPs at the request of the Sri Lanka Army from April 2010 onwards to date in Thunukkai, Karaganayakulam, Puliyankulam, Nedunkerni, Pooneryn, Marasamulli and Paranthan. Hence, ‘Success-Colombo’ has been of immense benefit to both the Sinhala and Tamil community who have suffered tremendously from the civil war which concluded in May 2009. * Just as much as the Sinhalese are now learning Tamil, Tamil people in the North and East should also learn Sinhalese. I recommend that the Sri Lankan Army who are now serving in the North and East be employed in the schools and to teach the Tamil children the Sinhala language just as much as the Sinhala students in the rest of the country are learning Tamil compulsorily. The value of learning English should in no way be compromised, for it enables us to communicate with the rest of the world, improve our knowledge and widen our horizons. * Before the commencement of the medical clinics, it was customary to conduct a Janahamuwa followed by singing of the national anthem. Sadly, it was found that 95 percent of the people in the North could not sing our national anthem. Hence it is of utmost importance that the national anthem should be learnt by all citizens of our country. This is essential for national integration and reconciliation. * We now live in a free and liberated country where all citizens Sinhala, Tamil and Muslims enjoy equal rights and opportunities. Hence I cannot see any need for any special political package or political solution to be provided to the Tamil community alone. * The problems faced by the Tamils regarding education, job opportunities, housing, land and water, transport and health facilities etc are also faced by the Sinhala and Muslim communities. Hence solution to these problems should be provided equitably to all the citizens within the framework of the unitary Sri Lanka. * During my work in the North and East, I have travelled extensively and seen large extents of unutilized fertile land. Land utilization and development is part and parcel of development of our nation. Hence I recommend the poor landless peasantry of our nation be provided this crown land on equitable basis for maximal utilization under the program ‘Api Vavamu - Rata Nagamu’. * My explanation for the often-quoted ‘brain drain’ is multi-factorial. In the medical intake of 1969 to the Faculty of Medicine Colombo University, I was one among 150 (75 Tamils, 73 Sinhalese and 2 Muslims). Of this intake, only three Tamil doctors now serve the country. 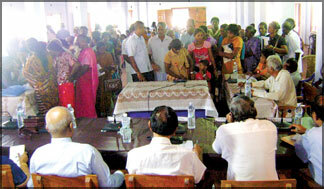 There are about 35 Sinhalese doctors remaining and serving the country. The reason for this exodus of Tamil doctors is not due to racial discrimination as admission criteria was purely merit based. Neither was the exodus due to the 1983 riots as the migration occurred long before this. If any injustice was done regarding admissions it was to the Sinhalese and Muslims due to lack of educational opportunities in rural areas at that time. I would recommend that university admission be based on merit, on ethnic proportions. The reasons for the brain drain I feel were partly economical, partly search for pastures with better working conditions, lack of binding family ties, lack of patriotism and national identity. * Much interest has been generated among the international community regarding the IDPs. Foreign observers have visited the Menik Farm in their hundreds and urged the government to resettle the IDPs in their former lands hastily. I wished the international community showed the same interest about the Sinhala and Muslims IDPs who were evicted by the LTTE and lived in refugee camps in Mannar, Vavuniya, Trincomalee and Welioya (Track 7, Avaranthulawa, Ulukkulama, Mahindapura and Gravel Waththa). The international community has further helped the Tamil IDPs returning home with dry rations for six months duration, Rs. 50,000 and 20 roofing sheets per family. However, the Sinhala people who have returned back to their lands in Welioya (Janakapura, Monaraweva) and Vavuniya (Track 7 Avaranthulawa and Ulukkulama, etc) have received no help at all from the international community. However, organizations like Success Colombo have helped these people. Discrimination in this manner causes dissatisfaction among the communities and will interfere with reconciliation. My opinion regarding some of the ‘Tamil Diaspora’ who have gone against our nation. They have gained enormous benefits from the free education system in this country from the best schools in the island followed by university education totally free and made best use of the country for their professional progress and advancement. Many have migrated, majority of them for economic reasons and hold responsible posts in other nations. Instead of criticising the local establishments for non-existent racial discrimination and day dreaming about Eelam, they must be encouraged to return home. Their wealth and knowledge must be utilized for the development and uplift of the North and the East. * The common enemy for all patriotic citizens of this country was Prabhakaran and the LTTE. Having won the war with the annihilation of the LTTE, we Sri Lankans are all reconciled and now live in a liberated country free of the fear of terrorism. * Adoption of a ‘Sri Lankan identity’ should be the ultimate goal following reconciliation.